If you have tried installing Google Earth 5 recently, you may have run into some problem. I did, and it led me on a wild goose chase that ended at the ‘Being Civil’ blog. The article noted scaling problems when inserting images via the Civil 3D Google Image link. The article explains that the current download version (5.0.11733.9347) is bugged, but points to a previous version (5.0.11337.1968) and says that it should work properly. I did a Google search for “Google Earth 5.0.11337.1968“ and got numerous results. Be Aware!!! Most still downloaded from the Google Earth site current release. After installing I confirmed the version number; I got the same results! I ambushed one of my associates, who has been using Google 4.3 with Hypack. I had him mock up the same 2 overlapping images, and link them into Civil 09. Exact same result. 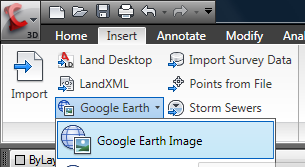 Google Earth 4.2 (4.2.0205) from filehippo BTW….The same site has links to ALL the versions! I did the same overlap test at a different region in Vegas and even worse results. I wish I had some conclusions. I can’t say what the answer is. It just does not work properly. All things said, I have not been keeping up with the “Google Earth gotta have latest version” push. It’s a nice tool, but I don’t use it every day. I cannot say when things went wrong, but I don’t remember a problem in 2008. 2009 was a blur, and all I did was study for Certifications. I might be inclined to blame my poor abused machine, but my associate received the same results from a different version of both Civil and Google. If you are having the same trouble, please post here so I can determine a pattern. Then maybe we can get Justin and Jason will to do a little more research for us. John is an Autodesk Certified Professional with a background in Manufacturing, Aviation, Mechanical Design, Civil Design, and Motion Control. He speaks Japanese and English, and works as an R&D consultant and technical author.